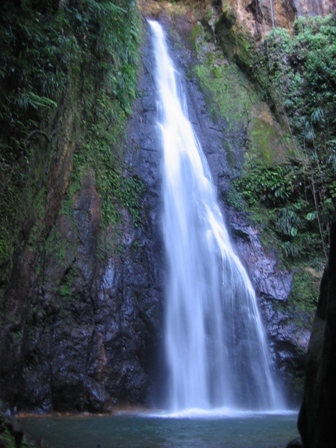 Dominica (pronounced Domineeka) was first seen by Columbus on a Sunday in November 1493, hence the name. It has been said that if Columbus were to visit the Caribbean again today, Dominica would be the only island that he would still recognize. At this time there is virtually no industry, and the natural resources are the island's main assets. 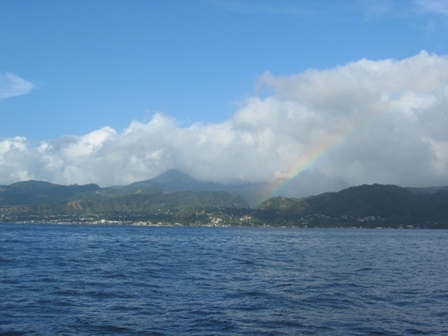 In the 17th century the French attempted to colonize the island as it lay strategically between Martinique and Guadeloupe. For these same reasons the island was also coveted by the British. Due to the rugged nature of the terrain, however, the Caribs were able to fend off the Europeans to the point that for years the island was declared neutral belonging to the Caribs. 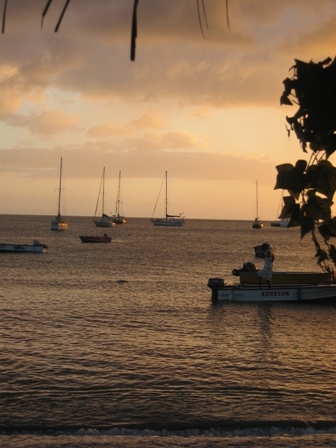 In 1783 the English claimed the island, having driven the Caribs inland, away from the coast. The French continued to also have a presence until 1805, when the British paid them a large indemnity. 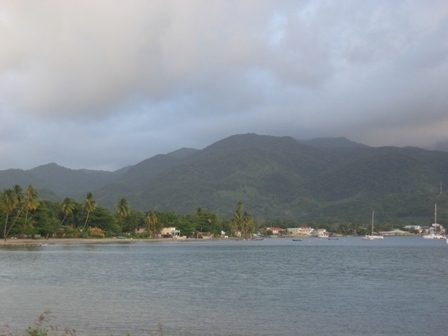 To this day several towns on the island have French names, and people speak a french patois close to the Creole from Martinique and Guadeloupe. 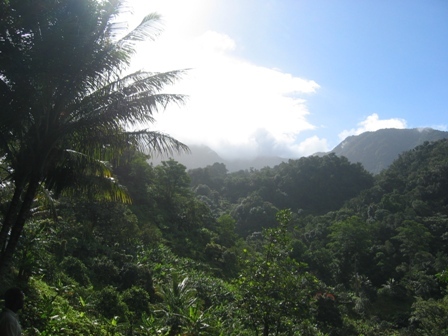 Today, there are still approximately 3000 Caribs living on a reserve on the east side of the island. 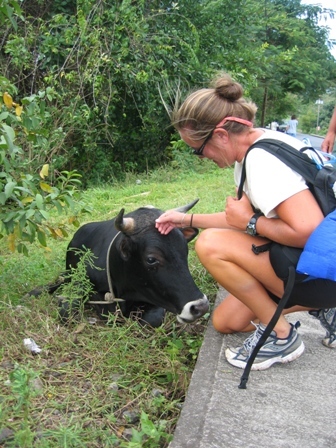 They sustain themselves with small scale farming and wicker items for the tourist trade. In 1967 the island became an associated state of the Commonwealth and gained full independence in 1978. 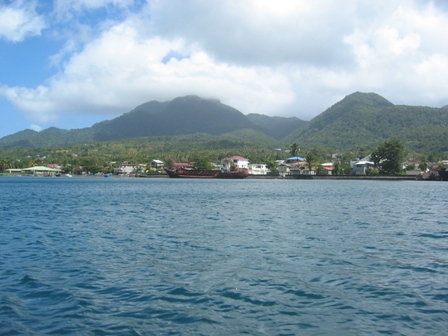 The economic development of Dominica is starting to slowly advance with port development in Roseau and Portsmouth. 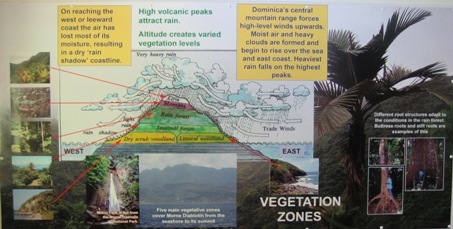 Currently, the hot debate in Dominica is whether or not a refinery from Venezuela is to be build or not. 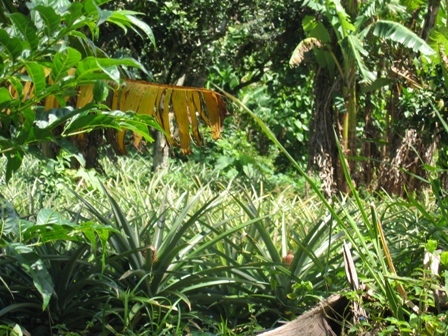 We hope that the Dominicans will preserve their natural resources in their quest for growth. 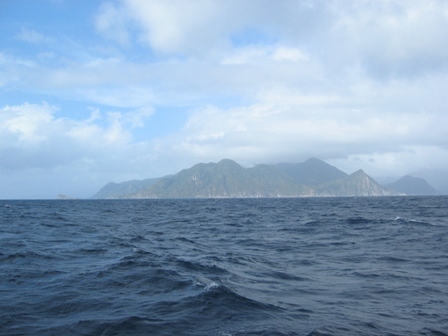 Approaching Dominica from the south. 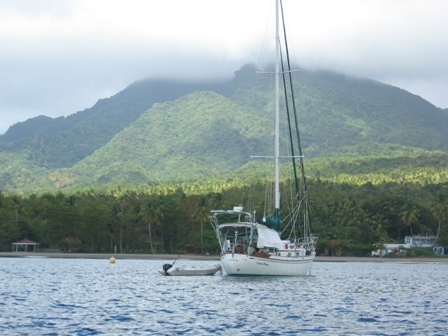 Our initial plan was to make landfall in Roseau, but due to a fast passage with speeds between 7 and 7.5 knots we decided to go for it and head for Portsmouth that same day. As we arrived on a Friday evening, we had to go to the Customs Officer's residence to check in the following Saturday morning. All the Customs paperwork was completed on his kitchen table, with music from next room. We knew this place would be different from most places that we had been. This is not Lena, but just a picture of the anchoring field. Lena was anchored next to Dalliance and we would call each other on channel 16 then switched to 72 to plan our day together. We had realized though that you really didn't want to broadcast to everyone that we were going to be off our boats for a day so we made up call names for each other. Ylva was "Hot Stuff", I was "Bad Girl", Marco was "Aqua Man" and Jonas wanted to be "Captain Pink". We told him he had to come with a better name than that but we will use it until a better name comes along. 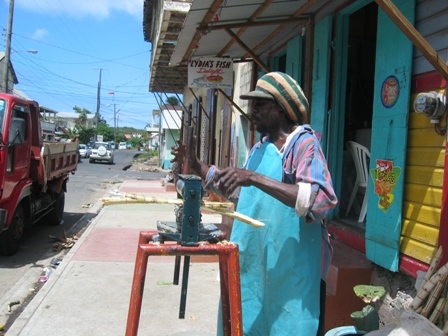 We met Africa on this Portsmouth main street, where he was selling fresh squeezed sugar cane. 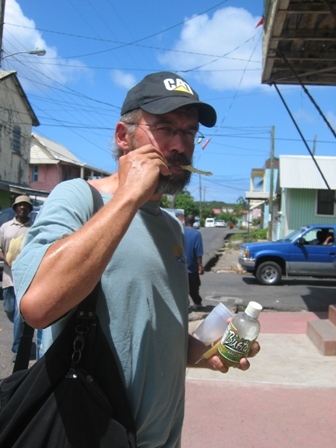 Marco sampling the sugar cane water. We both preferred to just chew on the can itself. 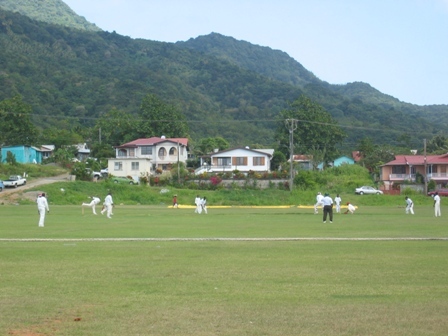 As in most British influenced places, cricket is BIG! 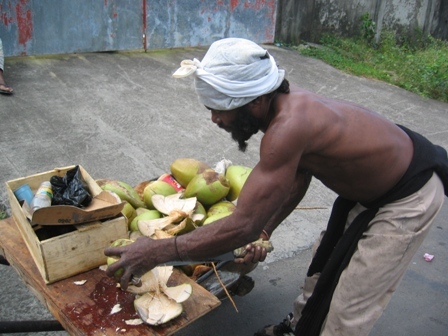 This man's name is "Dirty" and is known for his green coconuts. 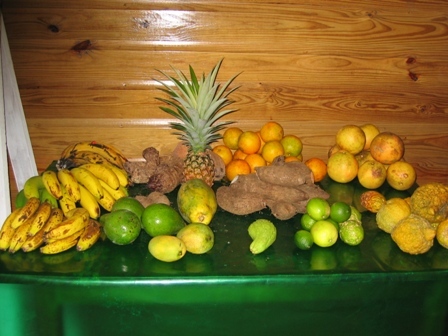 These are opened on the top with a large machete, and a served as a drink rather than food. 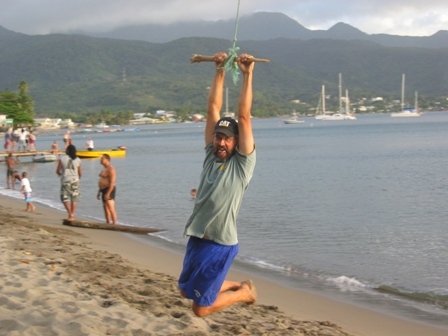 We did get to spend some time hanging out on the beach. Prince Rupert Bay in Portsmouth. 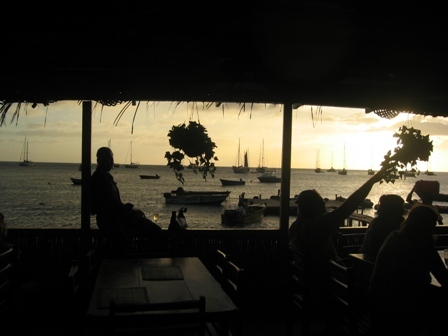 This is an evening view of the anchorage from Big Papa's Beach Bar. Dalliance in the middle of the picture, securely at anchor. 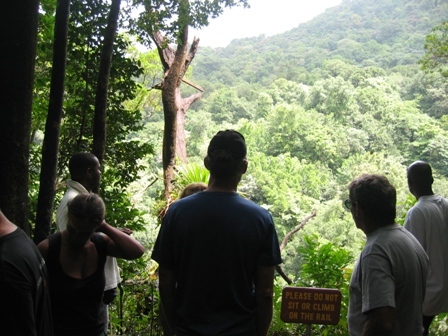 One of the highlights in Dominica was a boat tour on the Indian River which starts in the rain forest and drains in Prince Rupert Bay. We had the good fortune of having Martin as our guide. He was amazingly knowledgeable about the flora and fauna of the river, and was able to point out interesting findings at every turn. The stillness of the water was only broken by the splashes made by the food scraps dropped in the water by an iguana feeding in the trees overhead. 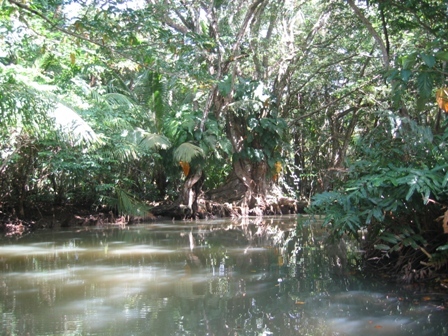 We were also told the Pirates of the Caribbean II and III were filmed on this river. In the second movie the Indian River is shown when Johnny Depp is going to see the witch and gets the jar of dirt from her. 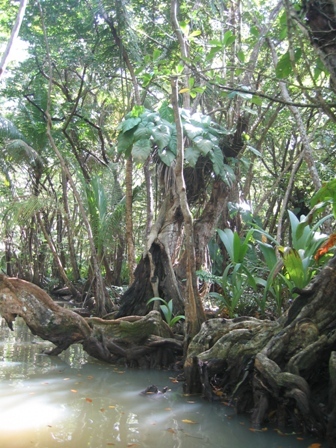 Stilt roots and buttress roots are two ways that trees have adapted to thrive in this environment. 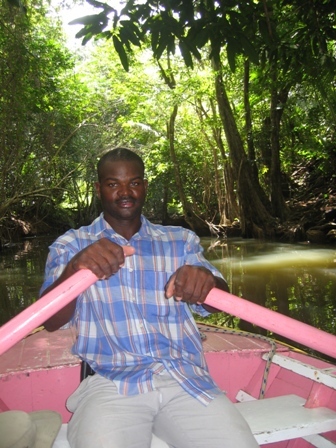 Martin Carriere, our guide, taking us down the Indian River. There is an amazing variety of crabs that live here, and their habitats include, salt as well as fresh water, and dry land. 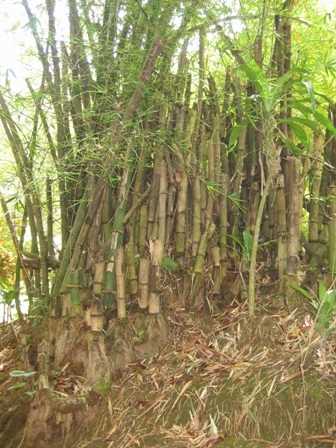 A stand of bamboo alongside the river. These plants can catch and sweeten the rain water, and attract a variety of humming birds. 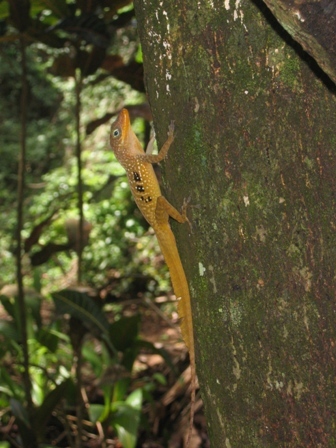 We have seen a tremendous variety of lizards, or is it the same kind that keeps changing colors? Brief but intense rain showers are the norm in this area. Dominica has been hit by several hurricanes in the past, and some of the coastal freighter still lie washed up along the shoreline. The next day Marco, Jonas, Ylva and I decided to take a hike through the rainforest. 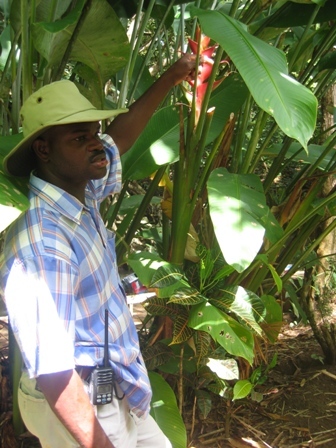 The first part of the inland tour included a trip through an agricultural area. It was fascinating to see where the products from home come from. 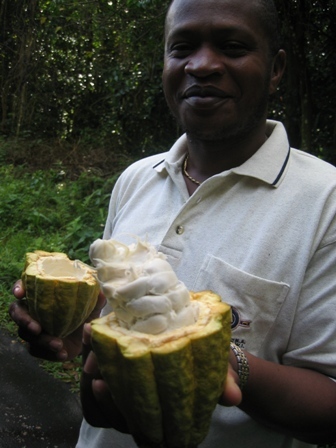 On the left our guide displays cacao beans in the seed pod. 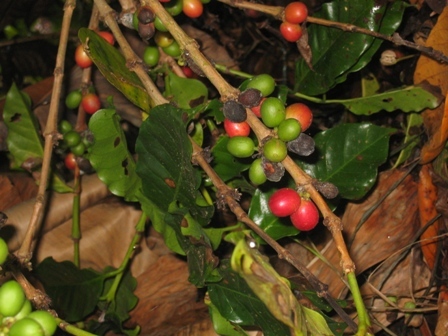 On the right is a fine Dominica coffee crop ripening. 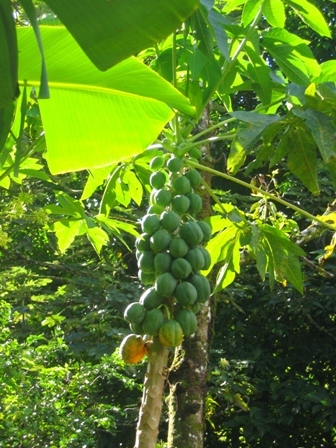 Papaya tree on the left picture, and a collection of various locally grown produce on the right. On the walk our guide picked fresh grapefruit for us. Unlike at home, there is no need to put sugar on them, they are so sweet already and you eat them just like and orange. Pineapple bushes with some early pineapple fruits on them. 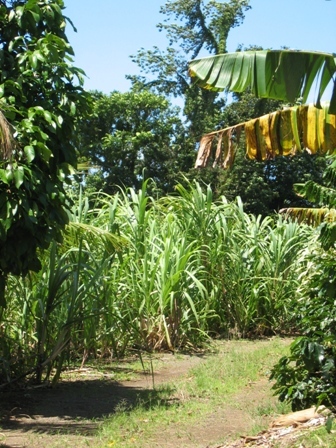 Sugar cane continues to be an important crop in this area, even though the European price subsidies have recently been withdrawn. This was due to complaints from other sugar producing nations, such as Brazil, regarding the unfair trade practices. 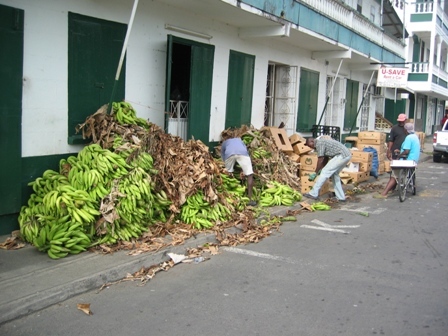 The crop is ready for packing and export. 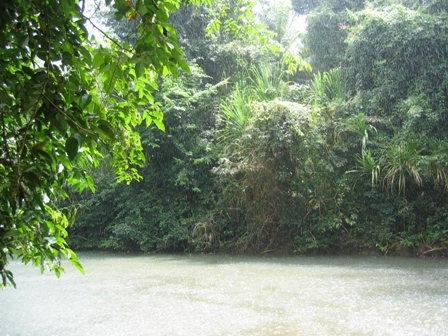 The next part of the tour was a hike through a rain forest. 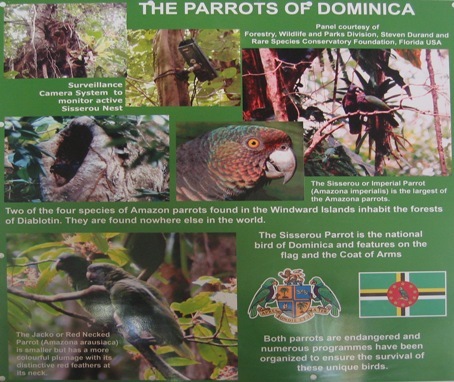 This area was known for having several large flocks of the endangered Dominican parrots. 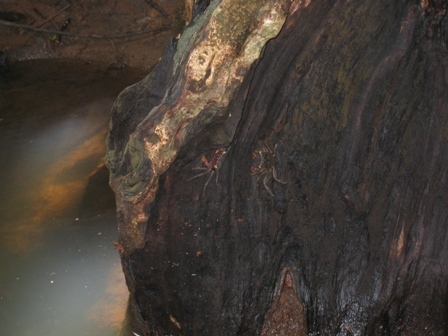 The emergent layer of the forest is where the tallest trees rise above the canopy level. These trees get the most light, rain and wind. 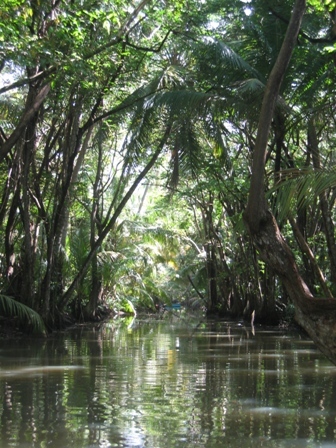 The canopy is the main tree cover of the forest. Rain and sunlight filters through this layer some 80 feet above the forest floor. 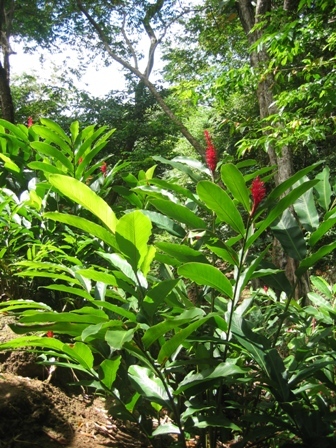 On the topsides of the branches are orchids, bromeliads (pineapple-like), ferns and lianes. Most of the birdlife is active here. 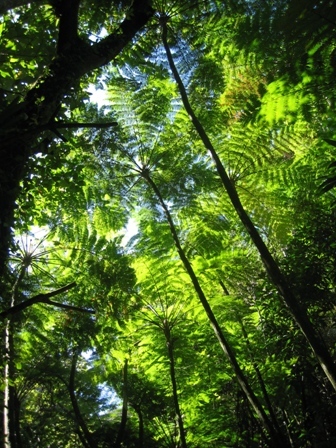 The understory is where the palms, tree ferns and saplings stretch up toward the sunlight. This is the most active area for moths and other insects. The floor is dark and humid, covered with seedlings. Termites, fungus, and bacteria feed on the layer of leaves, releasing nutrients for the trees above. 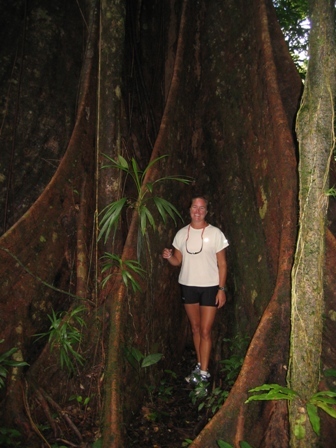 Holly is dwarfed by the large buttress roots. 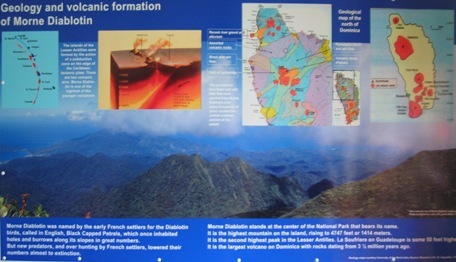 The Diablotin National Park had some great educational materials at the base of the trail. Here is the view point from which we got to see flocks of the Sisserou or Imperial Parrot (Amazona imperialis) and the Jacko or Red Necked Parrot (Amazona arausiaca). The parrots are rarely seen but when we were visiting, a particular flower that they feed on were in bloom. It was truly a sight to see flocks of birds fly by with such brilliant color. 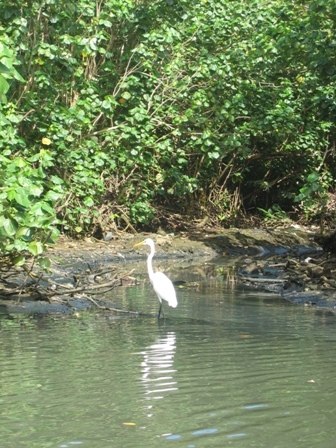 Here in Dominica, the primary source of protein for the locals is fish and chicken. It is incredible how many chickens are just roaming around the downtown streets and inside the stores. We met a gentleman that asked us if we wanted to buy his cow? He told us that he waits until there is a decrease in the catch of fish before he sells his cow for beef. This cow is not the one the gentleman was trying to sell us but one that was just laying beside the side walk. I was incredible how much it acted like a dog. It even nudged your hand when he wanted to be petted again.